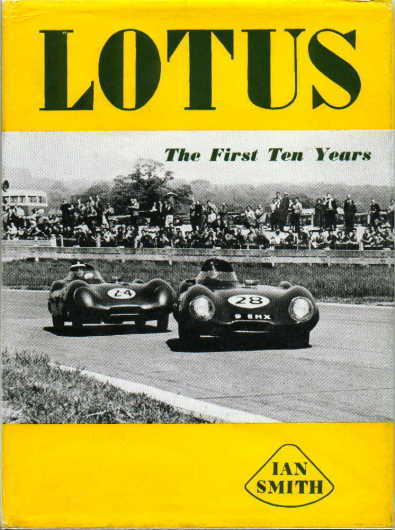 LOTUS - THE FIRST TEN YEARS by Ian H. Smith [Motor Racing Publications 1958]. 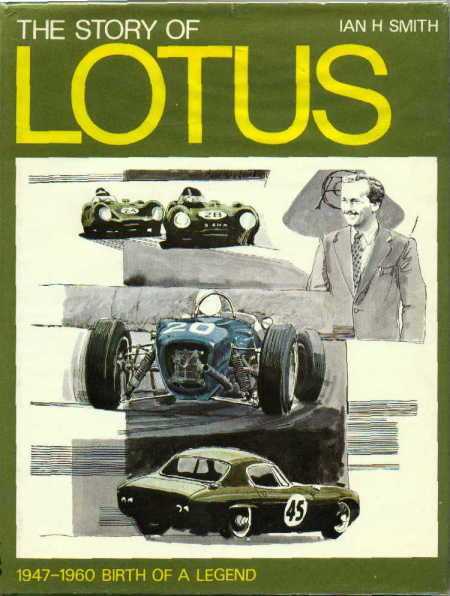 The first book about Lotus written by the secretary and founder of Club Lotus some five years before winning their first world championship. Now out-of-print, very hard to find and very expensive. 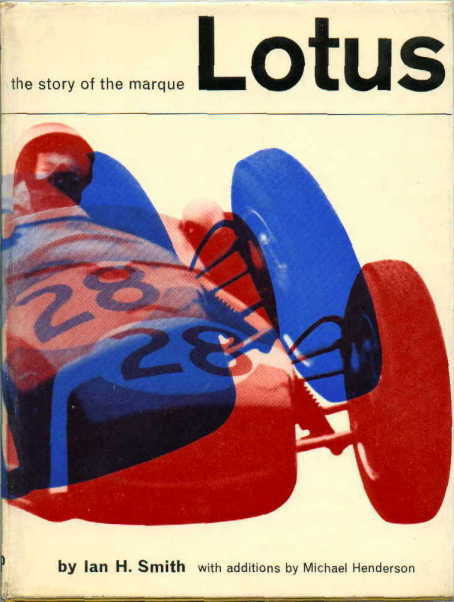 LOTUS - THE STORY OF THE MARQUE by Ian H. Smith with additions by Michael Henderson [Motor Racing Publications 1961]. Second edition of The First Ten Years (above) with the same content and extra chapters up to 1960. Now out-of-print, very hard to find and expensive. 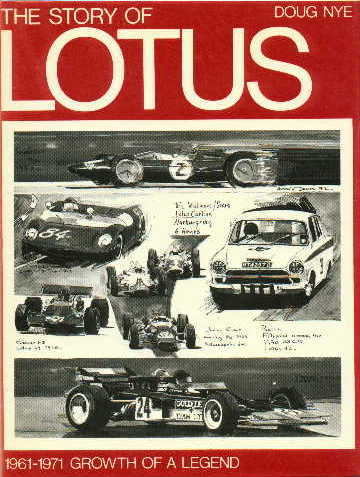 THE STORY OF LOTUS 1947 to 1960 - BIRTH OF A LEGEND by Ian H. Smith [Motor Racing Publications 1970]. Based on Ian Smith's Lotus The Story of the Marque (above), but mostly new content. Now out-of-print and hard to find second hand. THE STORY OF LOTUS 1961 to 1971 - GROWTH OF A LEGEND by Doug Nye [Motor Racing Publications 1972, 1978 & 1982].Jim Clark and Graham Hill, the World Championships and Indianapolis wins. Out-of-print but available second hand? 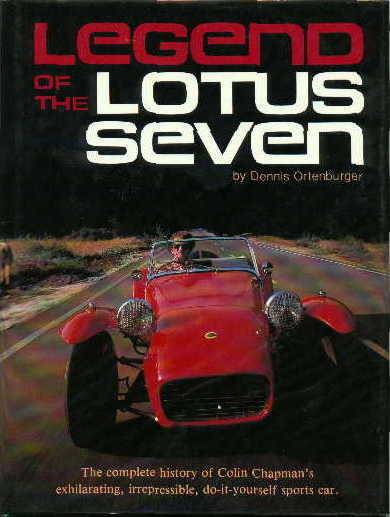 LEGEND OF THE LOTUS SEVEN by Dennis Ortenburger [Osprey 1981] "The complete history of Colin Chapman's exhilarating, irrepressible, do-it-yourself sports car." 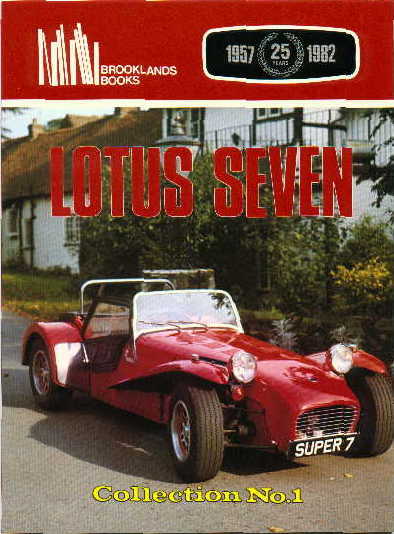 The first book dedicated to the Lotus Seven alone with a transatlantic tinge. Reprinted. 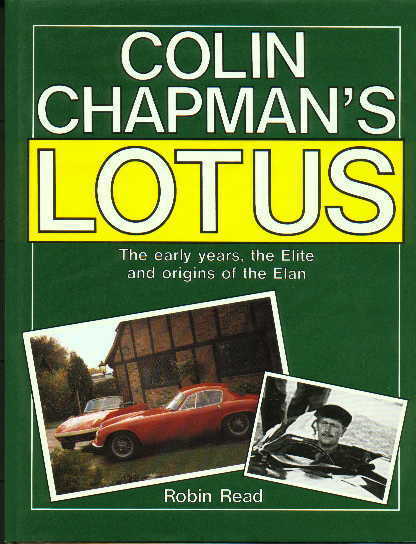 COLIN CHAPMAN'S LOTUS - THE EARLY YEARS, THE ELITE AND THE ORIGINS OF THE ELAN by Robin Read [Haynes 1989] An excellent book by Lotuses man in the U.S. in the early 1960's. A fascinating insight into Lotus and the U.S. market. Out-of-print and now rare. 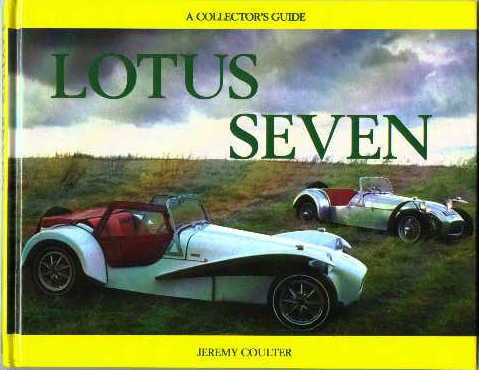 LOTUS SEVEN - A COLLECTOR'S GUIDE by Jeremy Coulter [Motor Racing Publications 1995] Second edition of The Lotus & Caterham Sevens  but now dedicated to the Lotus cars alone. A good first book on the subject and still available. 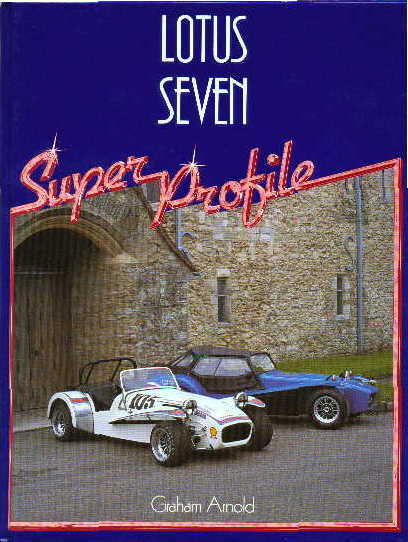 LOTUS SEVEN - SUPER PROFILE by Graham Arnold [Haynes 1984 & 1988].A good introduction to the Lotus Seven with some nice pictures. Out of print but can still be found second hand. 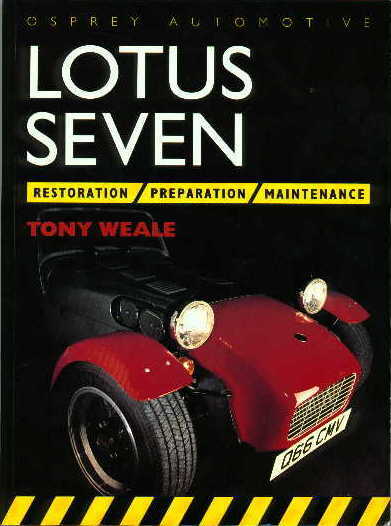 LOTUS SEVEN - RESTORATION / PREPARATION / MAINTENANCE by Tony Weale [Osprey Automotive 1991] A very good technical work that every owner should have. Lots of line drawings and numbers. Good for the Series IV as well. Still available but only just. 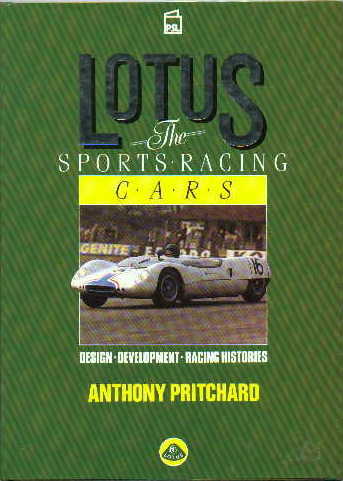 LOTUS - THE SPORTS RACING CARS - DESIGN - DEVELOPMENT - RACING HISTORIES by Anthony Pritchard [Patrick Stephens Ltd. 1987]. Not much Seven content but some relevance and a good read non the less. Out of print. 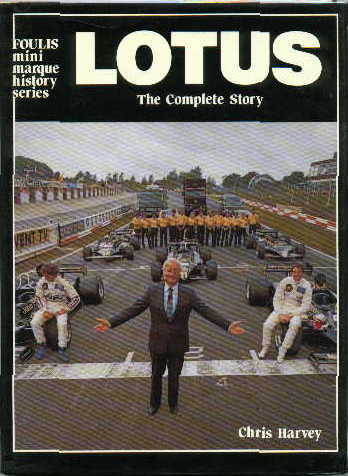 LOTUS - THE COMPLETE STORY by Chris Harvey [published by Haynes 1982]. Out of print. 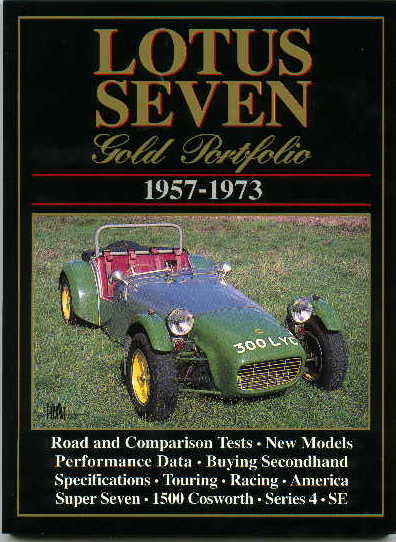 LOTUS SEVEN - COLLECTION NUMBER ONE published by Brooklands Books (n.d.) A reprint of Road Test Reports of Lotus and Caterham Sevens. Out of print. 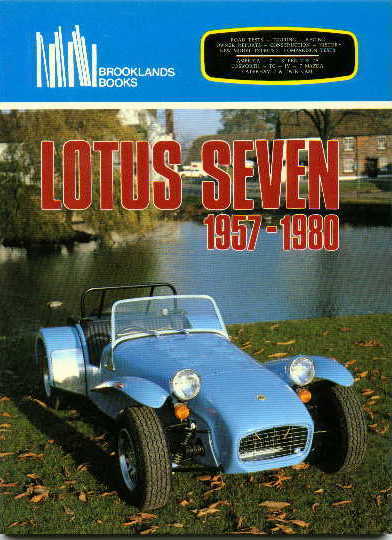 LOTUS SEVEN - 1957 to 1980 published by Brooklands Books (n.d.) A reprint of Road Test Reports of Lotus and Caterham Sevens.Out of print. LOTUS SEVEN GOLD PORTFOLIO - 1957 - 1973 published by Brooklands Books (n.d.) A reprint of Road Test Reports of Lotus Sevens. Still available. 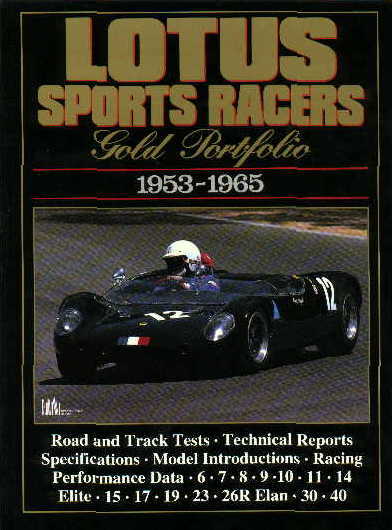 LOTUS SPORTS RACERS GOLD PORTFOLIO - 1953 - 1965 published by Brooklands Books (n.d.) Road and Track Tests - Technical Reports - Specifications - Model Introductions - Racing Performance Data on the 6, 7, 8, 9, 10, 11, 14 Elite, 15, 17, 19, 23, 26R Elan, 30 and 40. Some interesting reading. Still available. 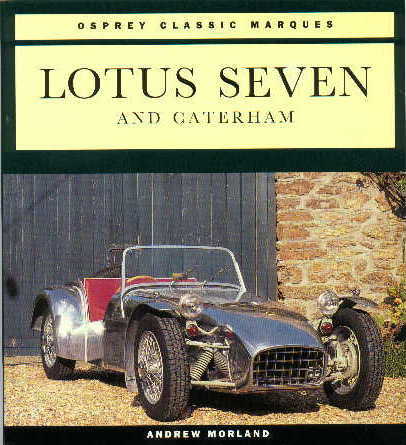 LOTUS SEVEN AND CATERHAM by Andrew Morland (Osprey Automotive 1994) Some good pictures of Lotus Mk. VIs and Sevens, Caterham and other 'Sevenesque' cars. Still available? 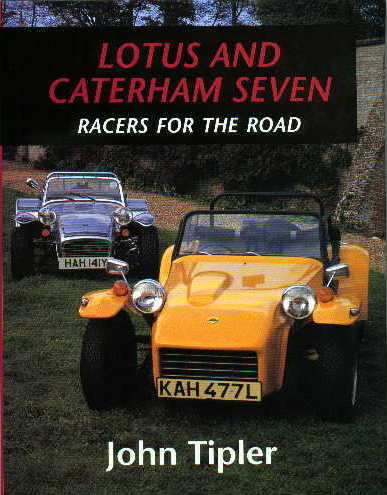 LOTUS AND CATERHAM SEVEN - RACERS FOR THE ROAD by John Tipler (Crowood Auto Classic 1995) About the cars, the makers and the owners. Still available. 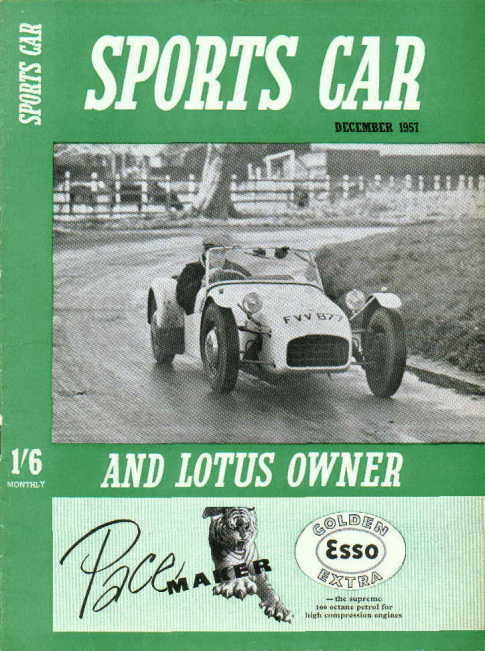 SPORTS CAR AND LOTUS OWNER is probably the best record of the history of Lotus during the late 1950's. It was sold publicly between November 1956 and September 1961 after which it was called Sports Car. The 4th. 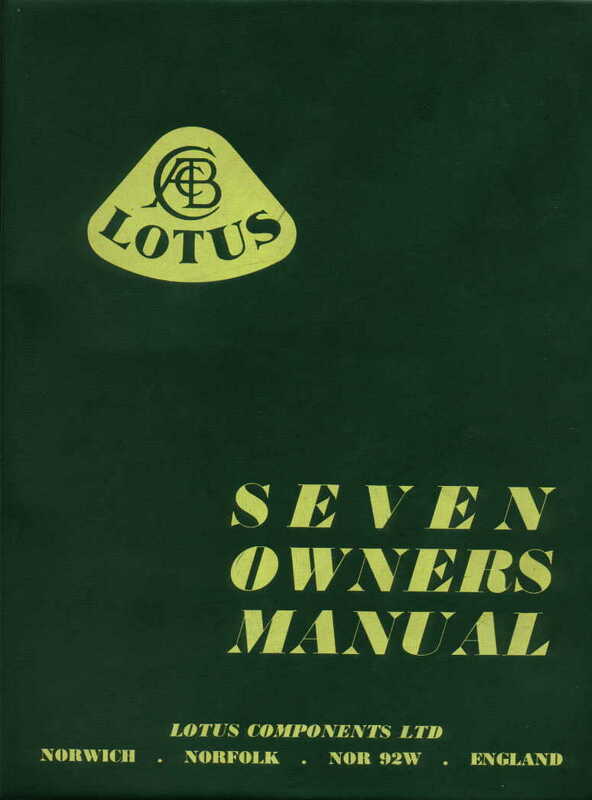 edition of the LOTUS SEVEN OWNERS MANUAL for the Series Two with a Supplement for the Series Three. A 'must' for all owners of S2 and S3 cars. LOTUS AND CATERHAM SEVEN. 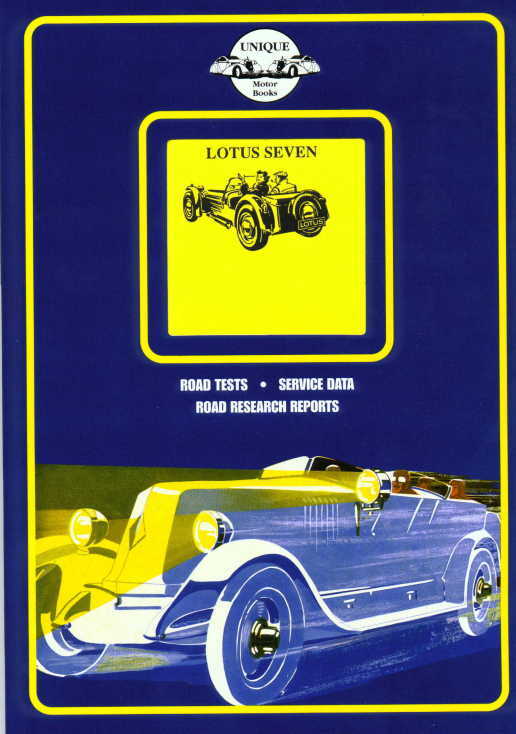 A booklet consisting of xerox copies of articles and road test reports taken from Sports Car and Lotus Owner magazine in the late 1950's and early 1960's published by Unique Motor Books (n.d. but available 1999). LOTUS SEVEN. 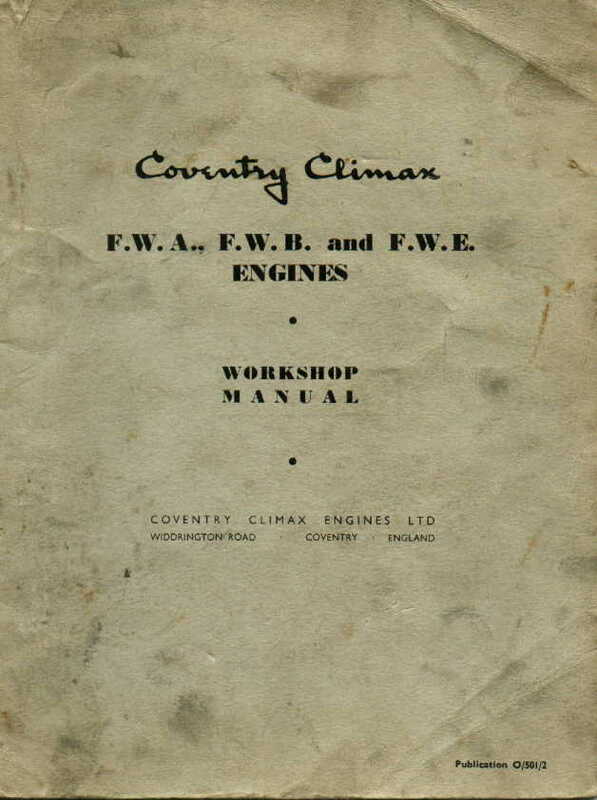 A booklet consisting of xerox copies of articles and road test reports taken from British and American magazines of the 1950's and 1960's published by Unique Motor Books (n.d. but available 1999). 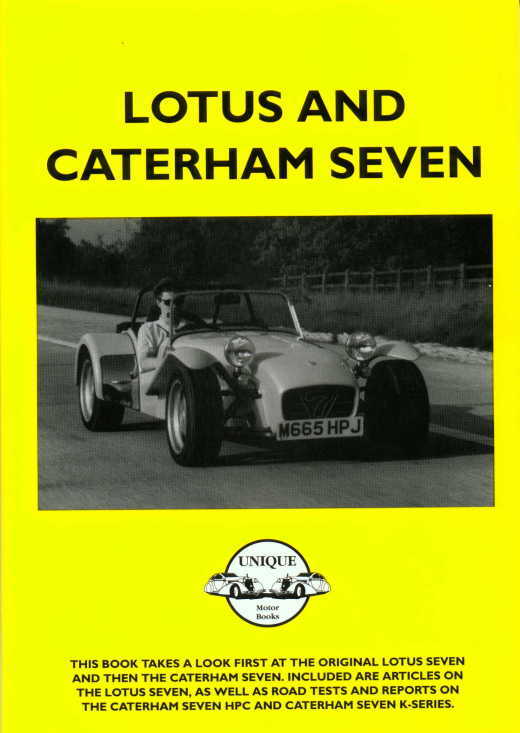 THE MAGNIFICENT 7 - The enthusiasts guide to every Lotus 7 and Caterham 7 from 1957 to the present day by Chris Rees. 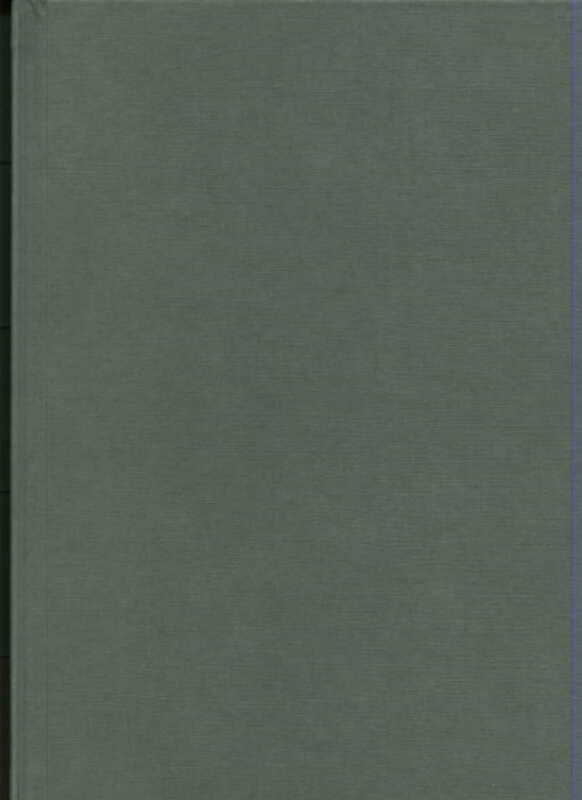 Published by Haynes Publishing 2002. An interesting 'coffee table' style of book but alas many inaccuracies.